Penelope Lively's wonderful memoir looks back at the context of her life and times, her memories, her reading and writing and the identifying cargo of possessions amongst which are found two ammonites, a cat, a pair of American ducks and a leaping fish. The WOMEN WE'D LIKE TO LUNCH WITH BOOK CLUB will discuss How It All Began by Penelope Lively. This month's book is How It All Began by Penelope Lively. Come by and join our discussion of The Photograph by Penelope Lively. Penelope Lively signs Family Album. Novelist and children's writer Penelope Lively was born in Cairo, Egypt, in 1933 and brought up there. She came to England in 1945, went to school in Sussex, and read Modern History at St Ann's College, Oxford. 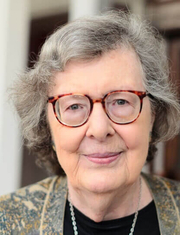 Penelope Lively contributes regularly to a number of national daily newspapers and literary and educational journals including the Sunday Times, The Observer and the Times Educational Supplement. She has written radio and television scripts and was presenter for a BBC Radio 4 programme on children's literature. She is a Fellow of the Royal Society of Literature, a member of PEN and a former Chairman of The Society of Authors. She was awarded an OBE in 1989 and a CBE in 2001. Penelope Lively is currently considered a "single author." If one or more works are by a distinct, homonymous authors, go ahead and split the author. Penelope Lively is composed of 11 names. You can examine and separate out names.